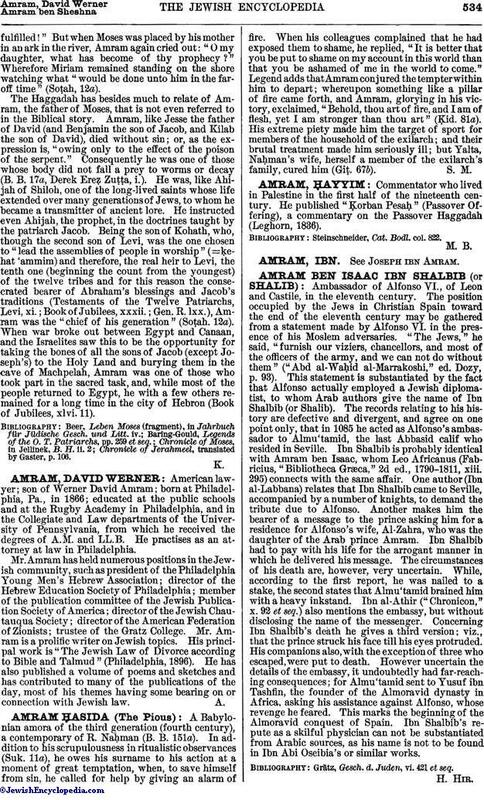 American lawyer; son of Werner David Amram; born at Philadelphia, Pa., in 1866; educated at the public schools and at the Rugby Academy in Philadelphia, and in the Collegiate and Law departments of the University of Pennsylvania, from which he received the degrees of A.M. and LL.B. He practises as an attorney at law in Philadelphia. Mr. Amram has held numerous positions in the Jewish community, such as president of the Philadelphia Young Men's Hebrew Association; director of the Hebrew Education Society of Philadelphia; member of the publication committee of the Jewish Publication Society of America; director of the Jewish Chautauqua Society; director of the American Federation of Zionists; trustee of the Gratz College. Mr. Amram is a prolific writer on Jewish topics. His principal work is "The Jewish Law of Divorce according to Bible and Talmud" (Philadelphia, 1896). He has also published a volume of poems and sketches and has contributed to many of the publications of the day, most of his themes having some bearing on or connection with Jewish law.